Documentarians have had a run on video game themed films recently. Between the intimate journeys in Free to Play, the uncomfortable portraits of Indie Game: The Movie and the focused beam of GameLoading, I'm glad to have finally seen Video Games: The Movie. While all of the before mentioned films are excellent in their own way, only Video Games: The Movie tackles the subject matter in such a broad and- almost - all-encompassing way. Director Jeremy Snead and executive producers Zach Braff and Cliff Blesinski (and a ton of Kickstarter backers) have put together a fairly complete history of the video game industry. Snead presents the information in an interesting way. Rather than simply present a chronological history, the film focuses sections on individual facets of video games. Starting with some baseline statistics (very basic for the most part, with a few interesting notes) about video game demographics and economic markers, VG:TM establishes a timeline marked by hardware generations and notable events. Each successive section of the film goes back through that same timeline, this time highlighting those sections particularly relevant to subjects such as culture or storytelling in games. This layered approach was interesting to follow and lent a satisfying flow to the hour and forty minute feature. There are tons of interviews with notable engineers, developers and personalities related to video games. Their insights and soundbites flesh out the majority of the film, Most of what we hear from them is short with a few notable exceptions. Sean Astin's narration provides a bit more exposition and ties together the developers' comments, but some sections feel a little rushed. VG:TH covers a lot of ground in a relatively short period of time. Some critics panned the film for not going over more of the industries issues regarding race and gender stereotypes and objectification. Indeed, these particular issues are not touched on, but the long running correlative that games cause violence is covered to some extent. It is largely brushed off as a non-issue and while I agree with this point, some viewers may not be aware of the latest research and statistics. As a film focused more on providing a broad history of the industry, giving meaningful time to such nuanced issues as gender and racial discrimination is problematic. These are subjects best discussed at length. A ten to fifteen minute segment wouldn't do them justice. Video Games: The Movie is a love letter to the industry. Devoted gamers should enjoy the film, though the information it presents is perhaps more useful for those less familiar with the video games past present and future. The parent who frowns at PC and console games, but spends hours playing Candy Crush, the partner that doesn't understand games and how they can possibly mean so much to those that play them. VG:TM has great potential to foster meaningful conversations between gamers and people in their lives like the ones mentioned above. 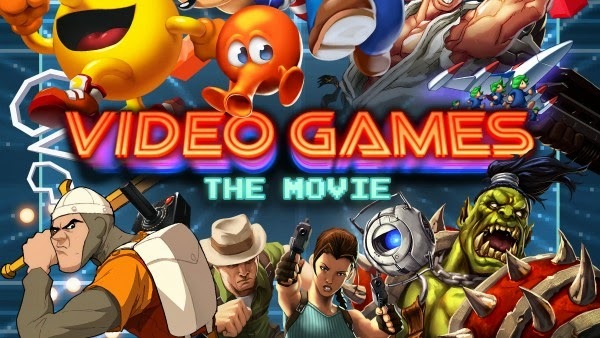 Video Games: The Movie is currently available digitally and is available for streaming via Netflix.